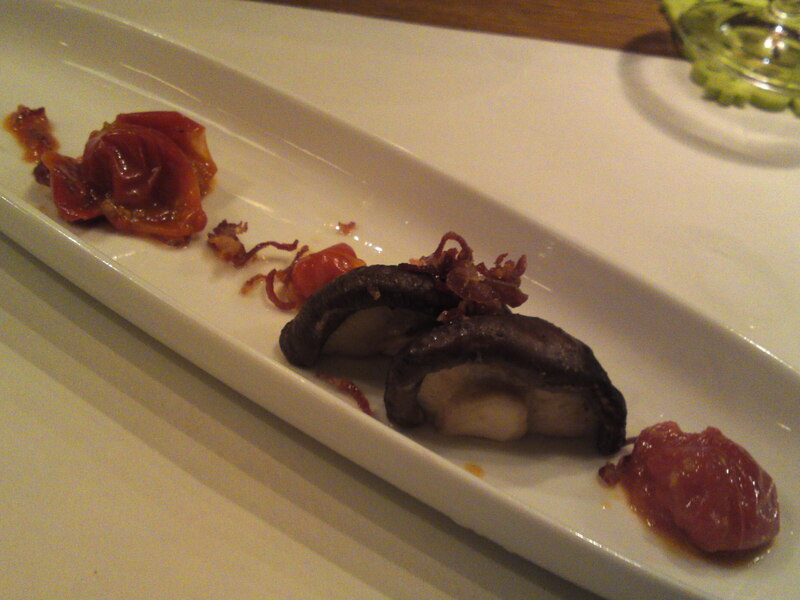 Italian Cuisine: Shizuoka Agricultural products as Appetizers: Aquavite! First appetizer from the side. Prices: reasonable to expensive. Top-class Italian wines. Private room for~8 people. 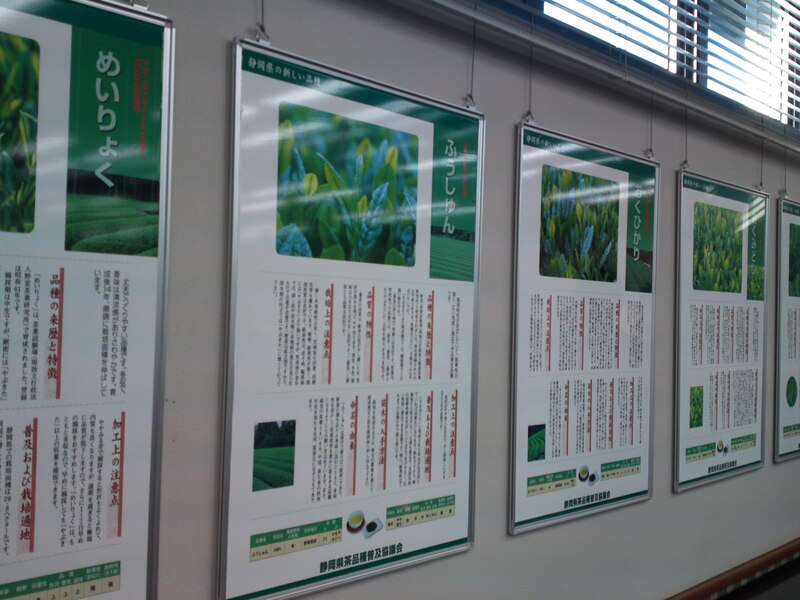 You don’t need to go for the whole course to sample Shizuoka agricultural products at your favorite restaurant. If it is a good enough restaurant, especially in Japan and Shizuoka, a great chef will be more than happy to serve you a few appetizers of his own with the drinks you have pordered. True to say, you do need to build a special relation with the chef, but that is one reason why you visit the restaurant, isn’t it? First appetizer from the top. Last night I did visit Aquavite in Shizuoka City where I asked the chef, Masaru Aoki/青木勝 to concoct a few tidbits as I was having a late break from work. I did have quite a few but I will introuce the best two of the evening! 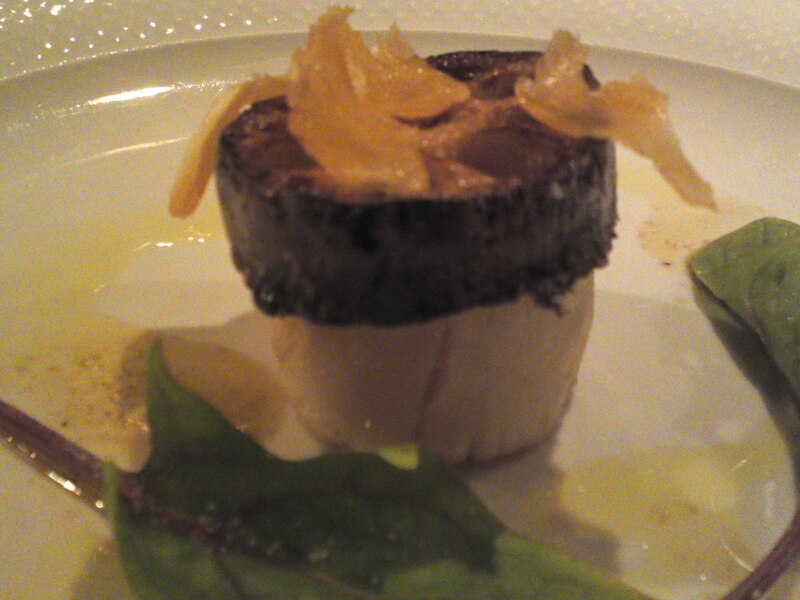 The first appetizer “from the back”. 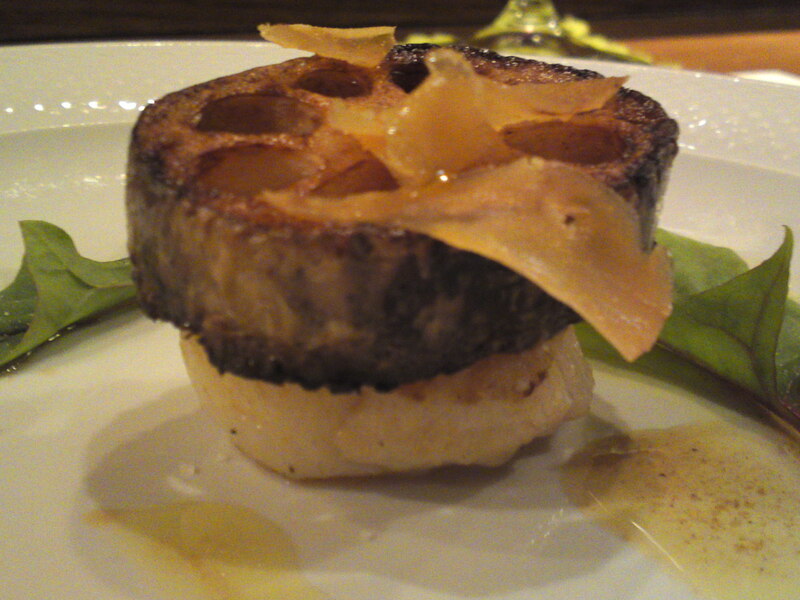 The first appetizer consisted of a scallop lightly fried in olive oil to keep it half raw inside. 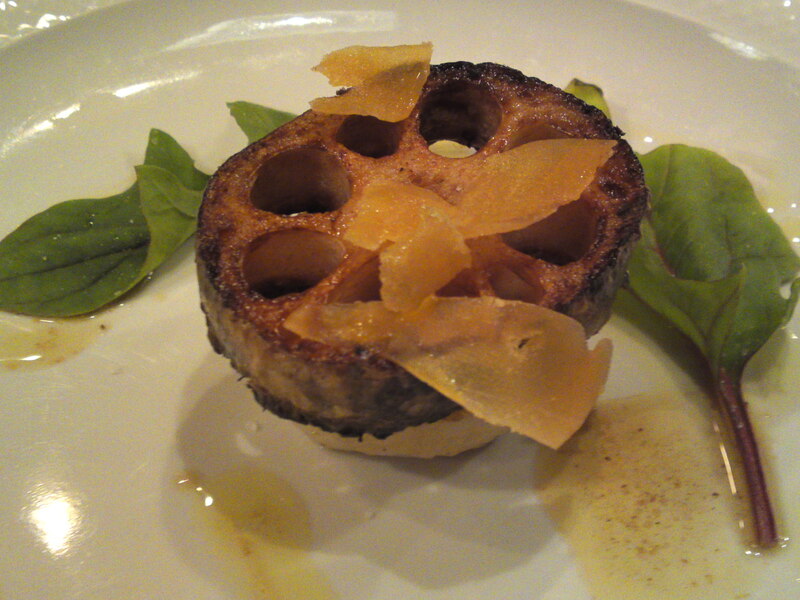 It was topped with a piece of fried lotus root/renkon from Asabata, shizuoka City and decorated with shavings of home-made karasumi/カラスミ/botarga in Italian or boutargue in French, a Shizuoka specialty of the dried mullet roe. 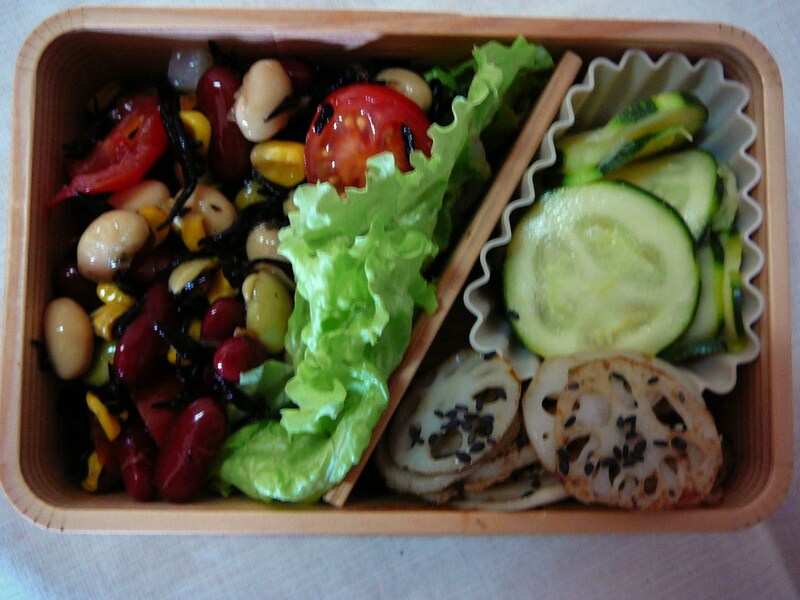 The salad spinach came from Nagomi Organic Farm in Fujinomiya City. The second offering of the evening was not all from Shizuoka Prefecture but it was certainly worth a second and third look! The Little Summer Tomatoes came from the Shizen No Chikara Farm in Shizuoka City and were fried in olive oil just long enough to extract their sweetness. 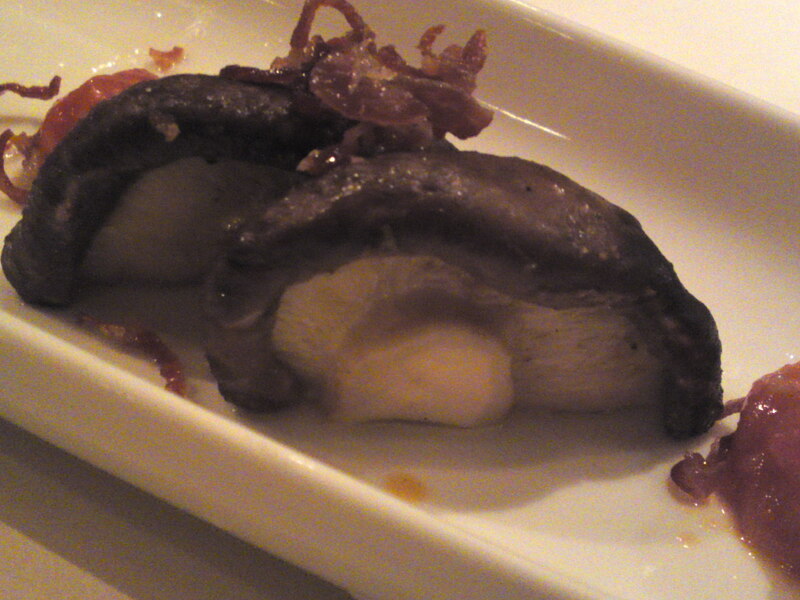 The fresh shiitake mushrooms had been sent by a friend of Masaru’s from Nagano Prefecture. 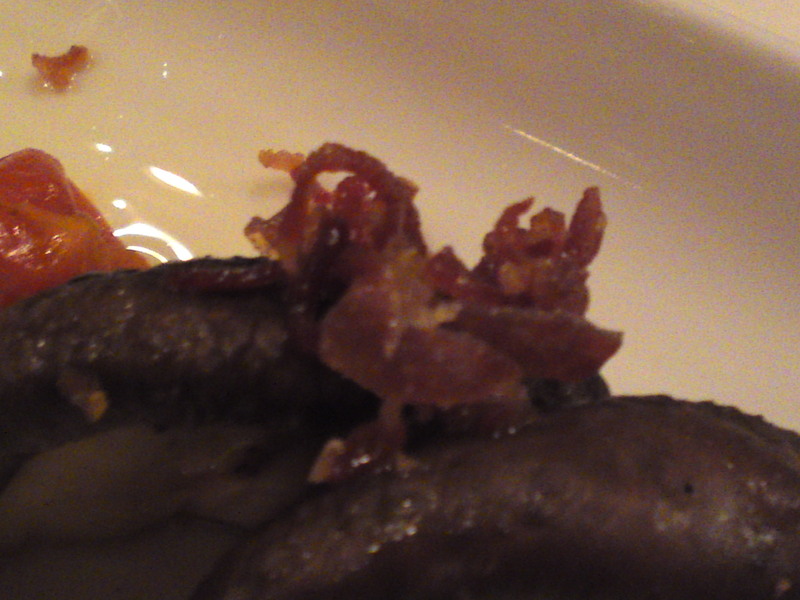 The topping/decoration was created with finely chopped Italian raw ham fried to a crisp! The whole needed little seasoning, what with the sweetness of the tomatoes and the saltiness of the ham, finely balanced with the juicy shiitake mushrooms! This promises to be the beginning of a neverending story! 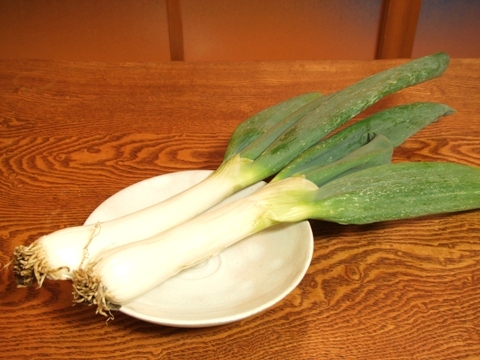 Leeks, or “negi/葱” in Japanese, are an almost universal vegetable. 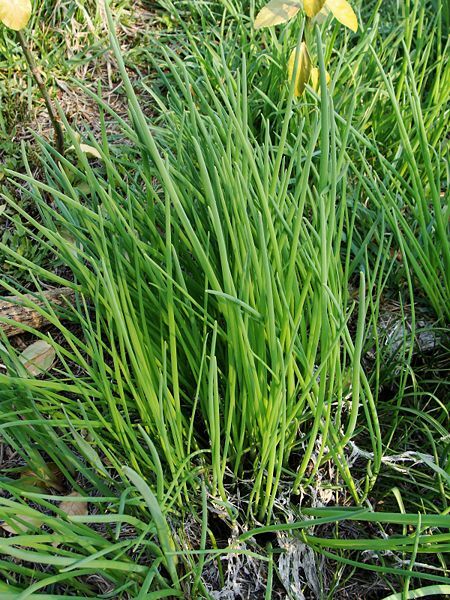 -Combined with Judas’ Ear Mushrooms, or sardine, or mackerel, or seaweed, holps lower blood cholesterol and high blood pressure, and prevents blood vessels hardening. A variety of the above. Turne sweet upon beig cooked. 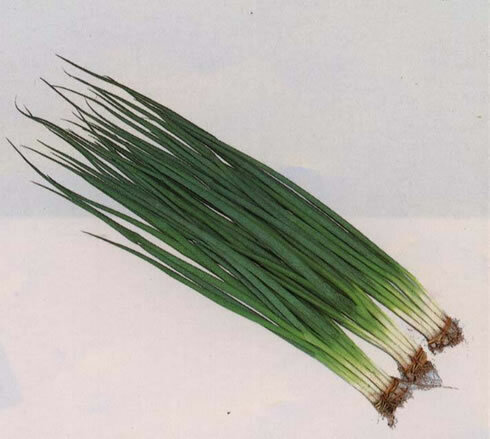 Spring onion, a cross between onion and leek. 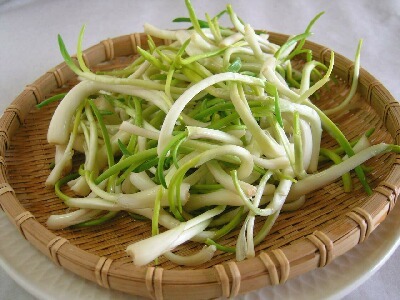 Very popular in salad and as sesaoning. 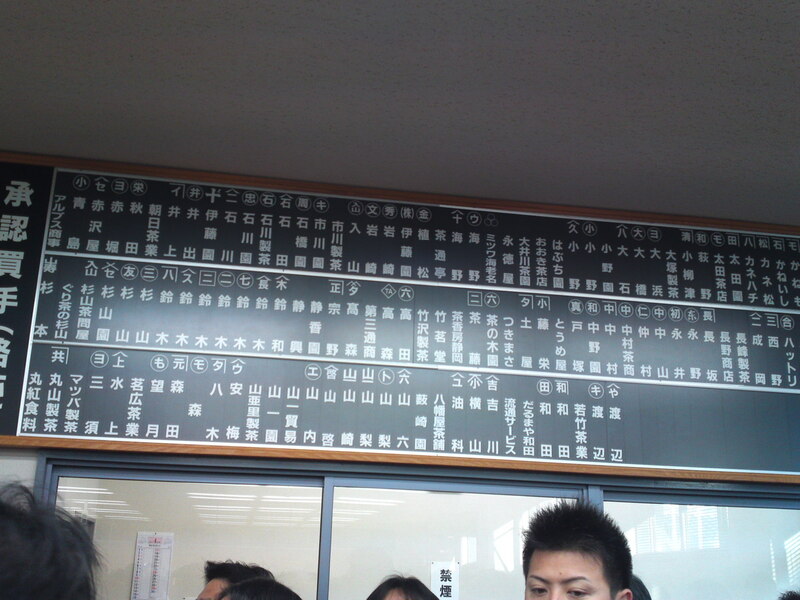 From Tochigi Prefecture. Fat and short, their scent and taste are different. Turn sweet with frost. 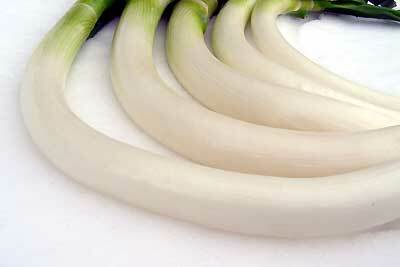 From Miyagi Prefecture. 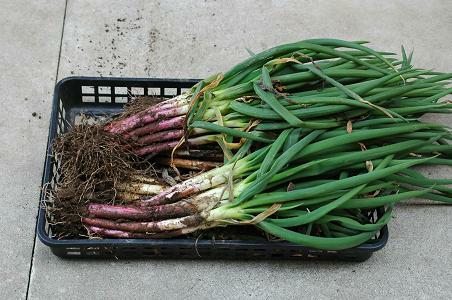 These leeks bend naturally as they grow! From Yamagata and Akita Prefectures. 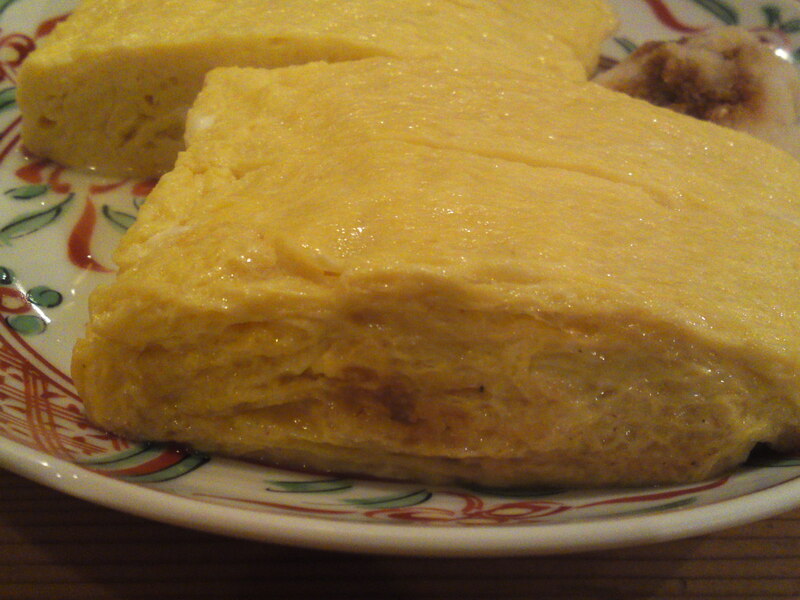 Very popular cooked with eggs or meat. 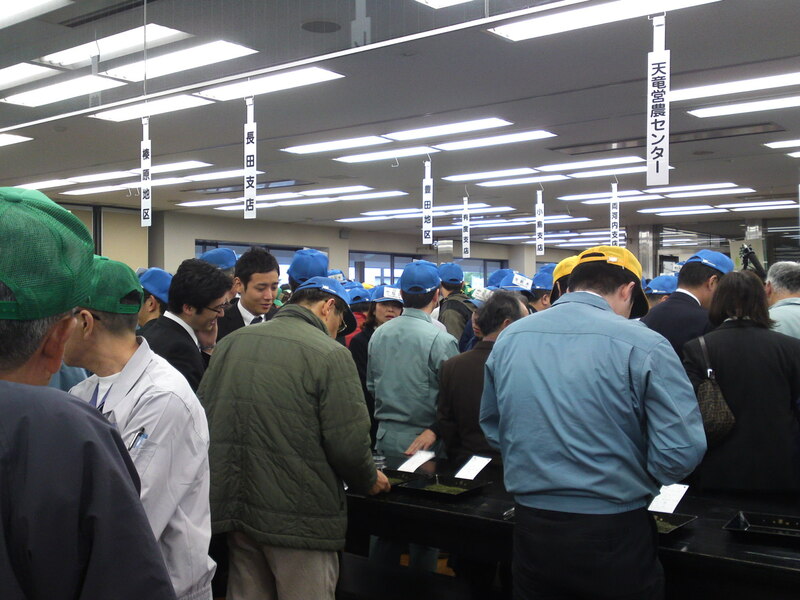 Since Marufuku Tea Factory (Shizuoka City) in the person of Ms. Asami Itoh/伊藤麻美 had kindly invited me to attend and interview at the official first day of the new tea auctions (officially) held today (April 25th) I found myself the only European (journalist) present at the early hour of 6:30 a.m.! 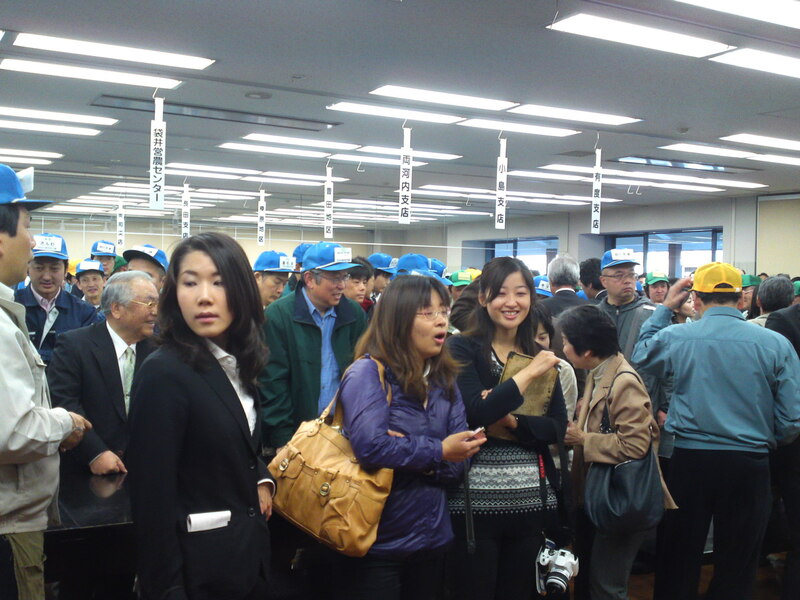 The event was held at the simply named Shizuoka Tea Building whose premises, inside and outside, were already crowded to the limit! 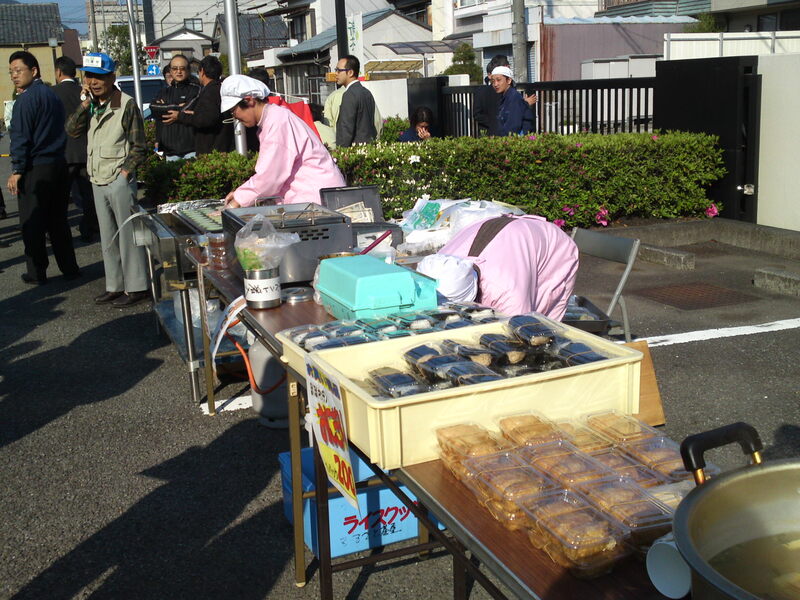 More than a participant was glad to buy and grab some breakfast/brunch (Japanese-style!)! 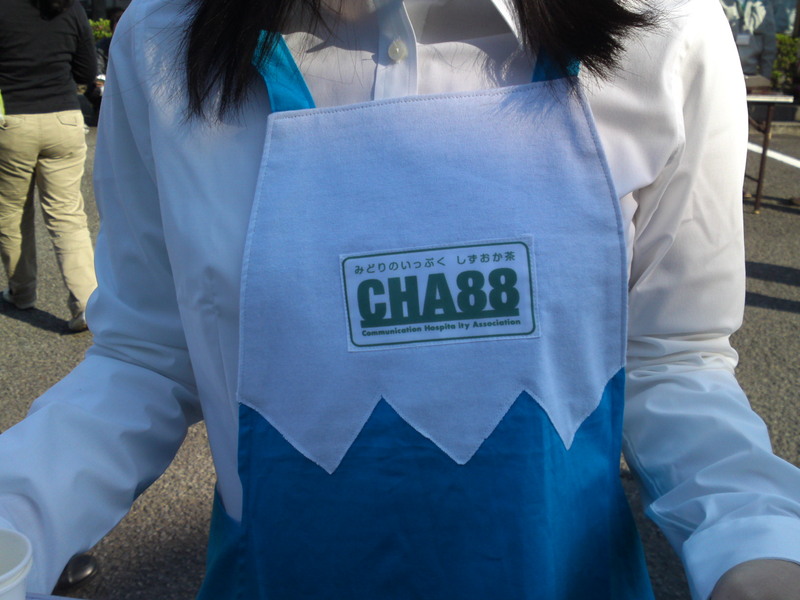 Another even bigger project called CHA 88 (coming report!) took the opportunity to advertise itself! 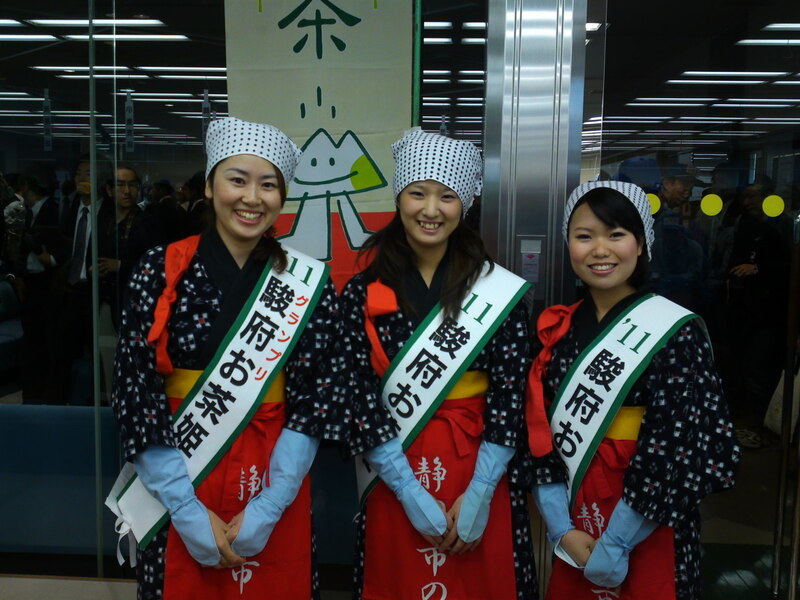 This event held by the whole of Shizuoka Prefecture was inaugurated on the 23rd! 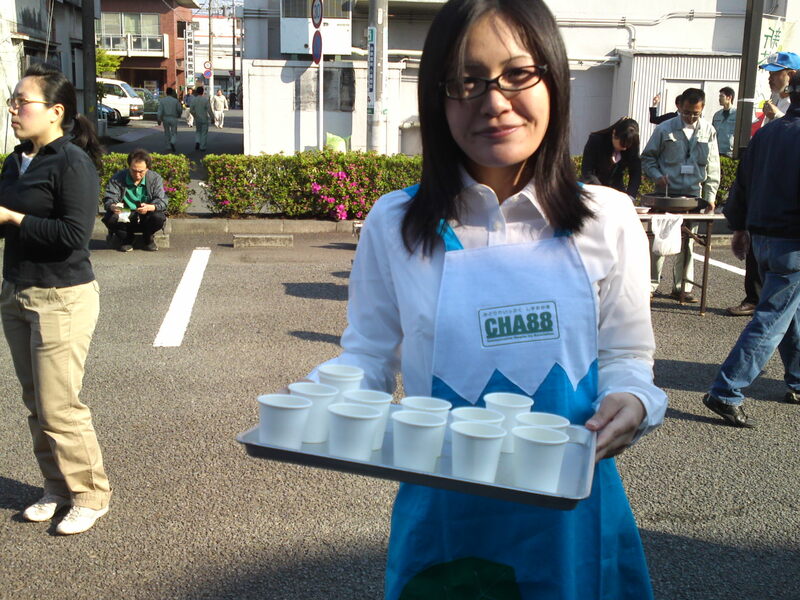 One could enjoy the sight and demonstration of tea massage by an expert! 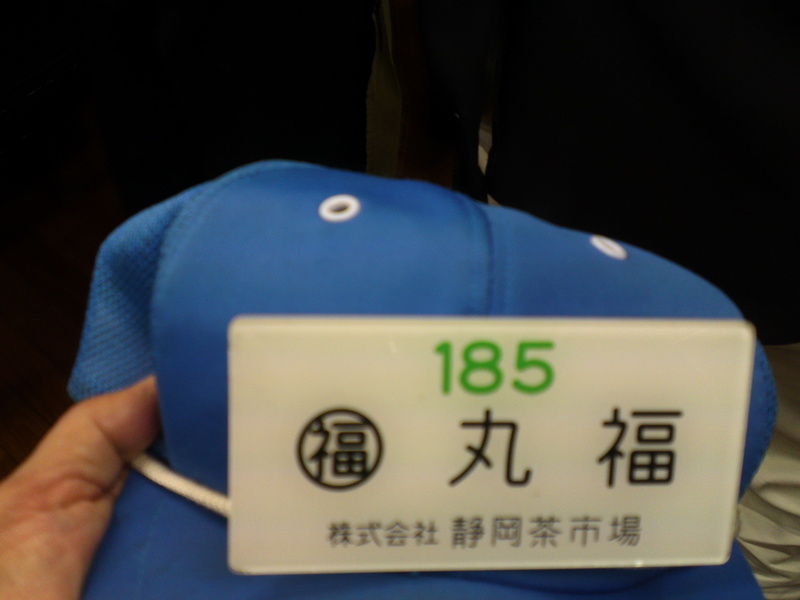 As a special guest I was wearing a cap with Marufuku Tea Factory written on it (the only journalist offered the privilege that day!)! All the names of the union member tea companies for an easy check! 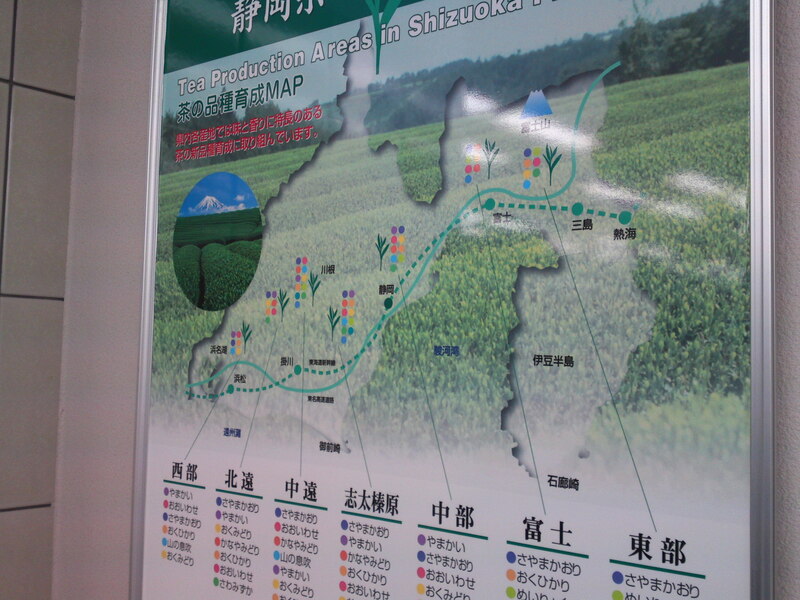 A map describing the diffrent tea producing regions of Shizuoka Prefecture! 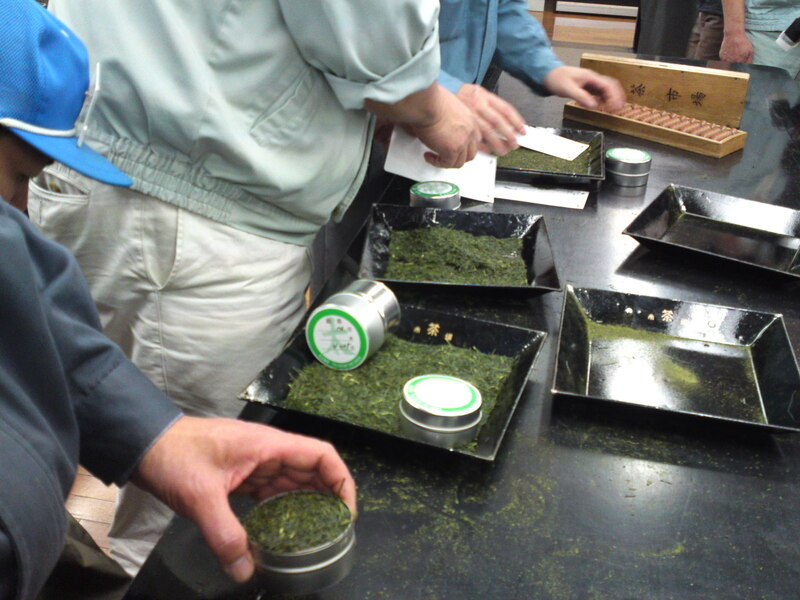 And plenty of explanations on the different tea varieties! The official “tea Ladies” of the day! Pretty, aren’t they? 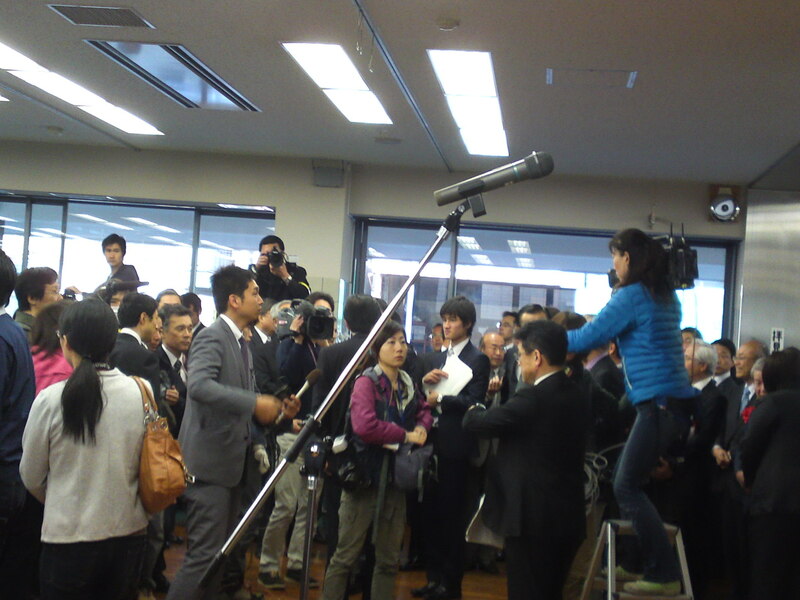 Even the “big guns” had come early: Shizuoka Governor Kawakatsu! 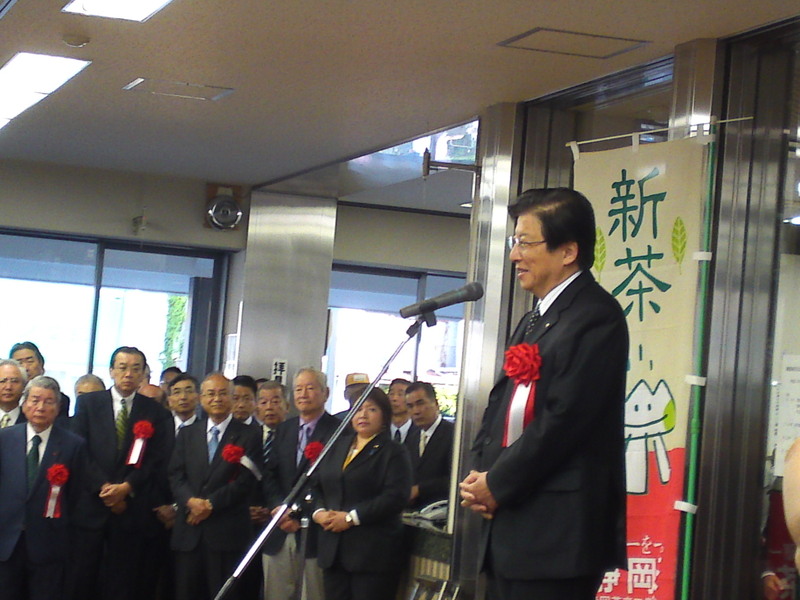 And the new 49-year old Shizuoka City Mayor Tanabe! This was before the “official speeches”. People got very serious then! 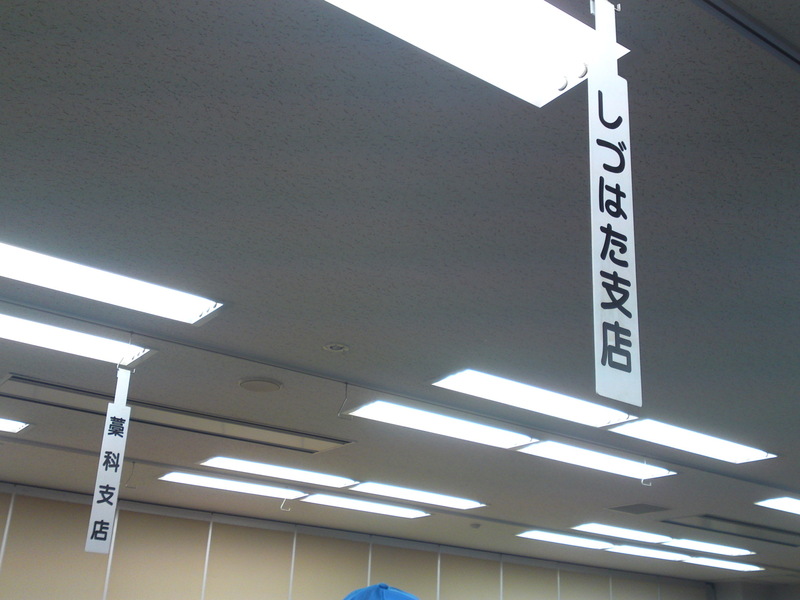 The auction room was divided into regions/territories (in Japanese parlance!) for good order! The blue caps are for individual sellers, the yellow ones for buyers and the green ones for the JA and other big government-controlled farm cooperatives. Checking the samples and their price tags! A sample of fairly good tea. 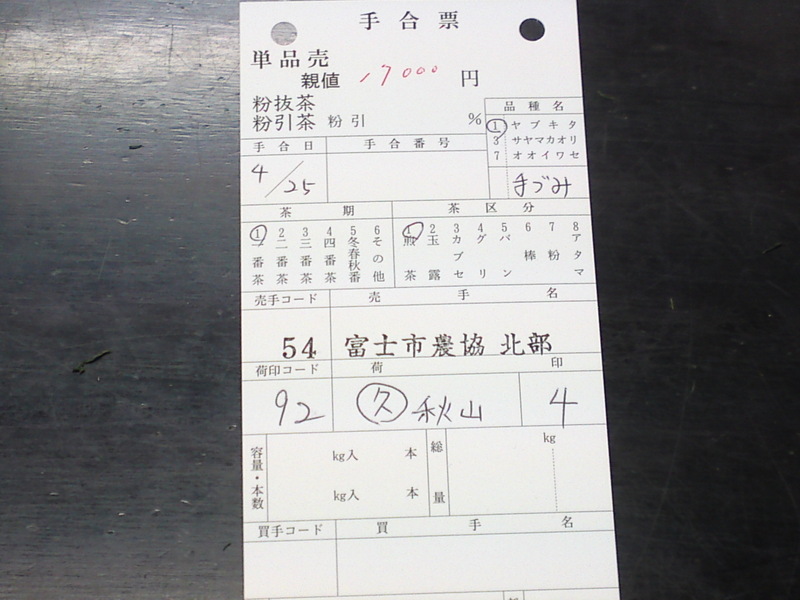 17,000 yen a kg. 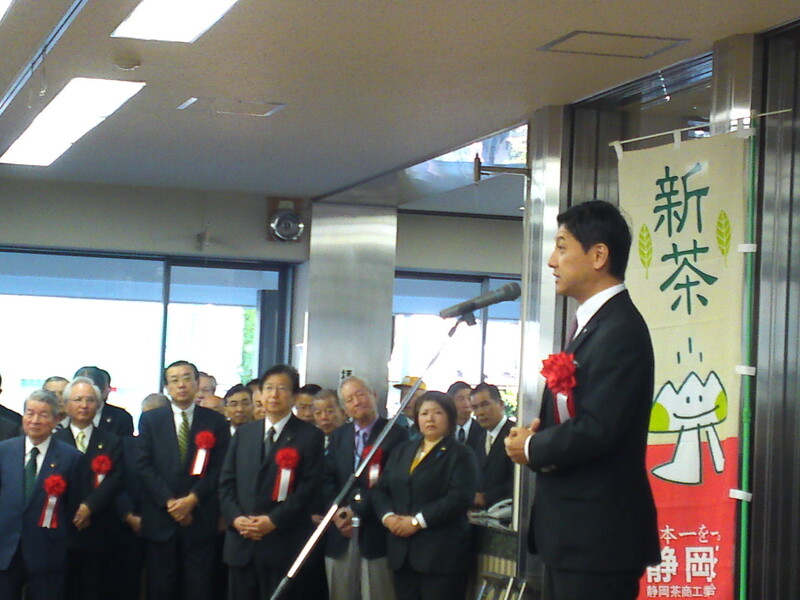 Quite high for a cooperative in Fuji City! 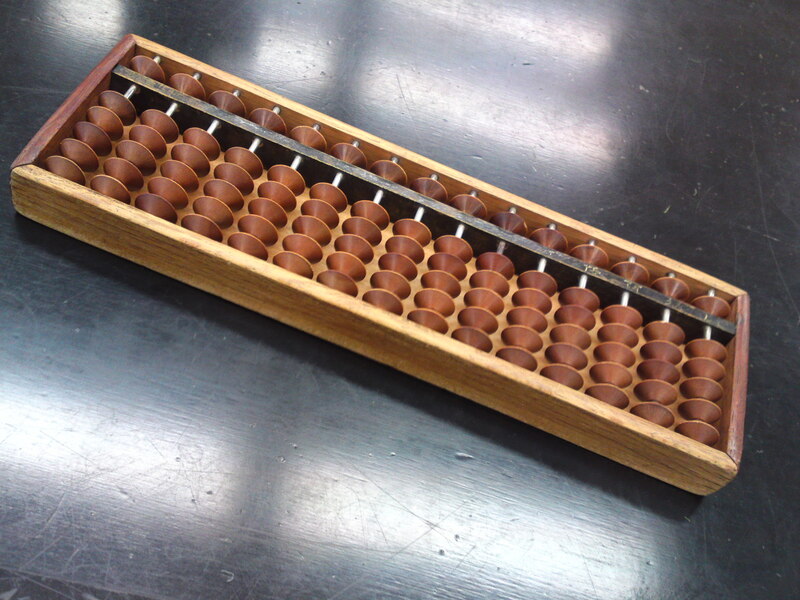 All transactioins and bargaining done with old-fashioned abacus/”soroban” in Japanese. A very practical system, actually! 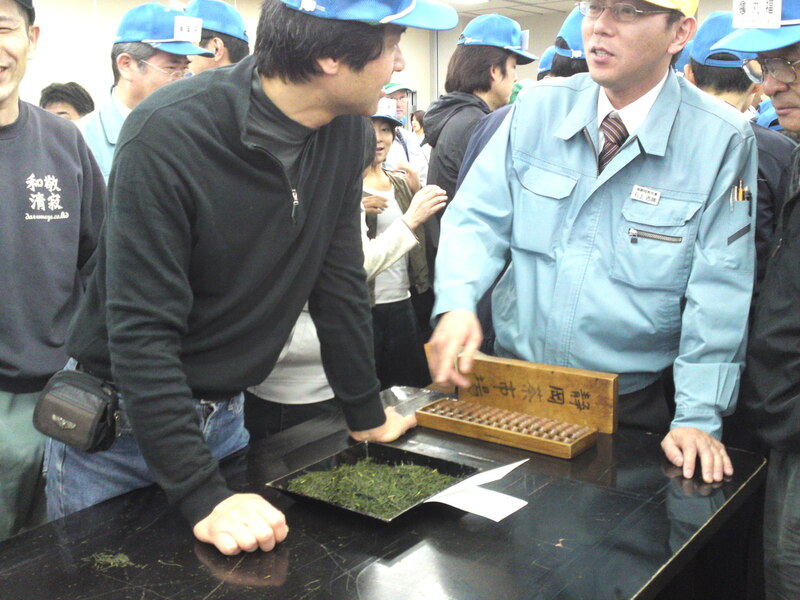 Marufuku Tea Factory’s Tea Master seemed pretty happy with business! There are some great pictures to be taken at such an event! Note: This year’s tea is of a very good standard as opposite to last year’s disappointing crops! 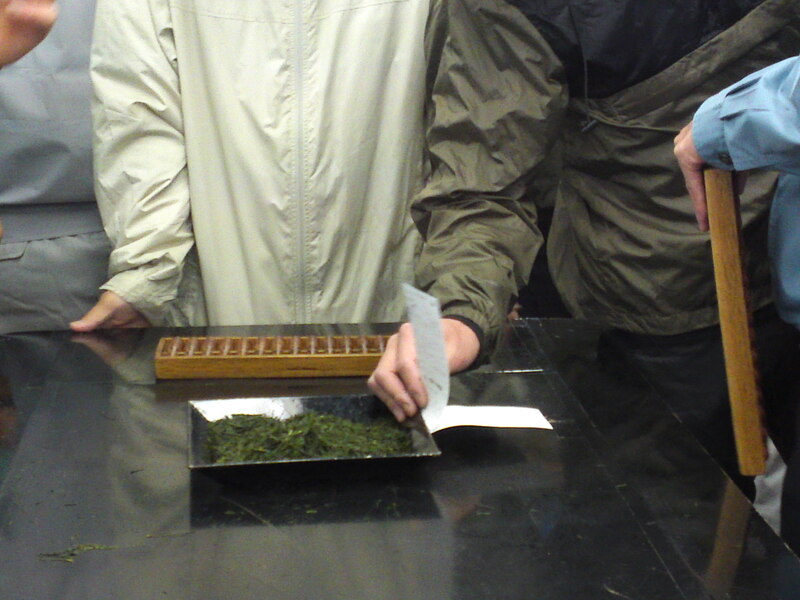 Next report will be in the tea-fields picking up the Ichiban Cha (First leaves of the year)! Cooking is so easy when you have the right and superlative ingredients within your hand’s reach! 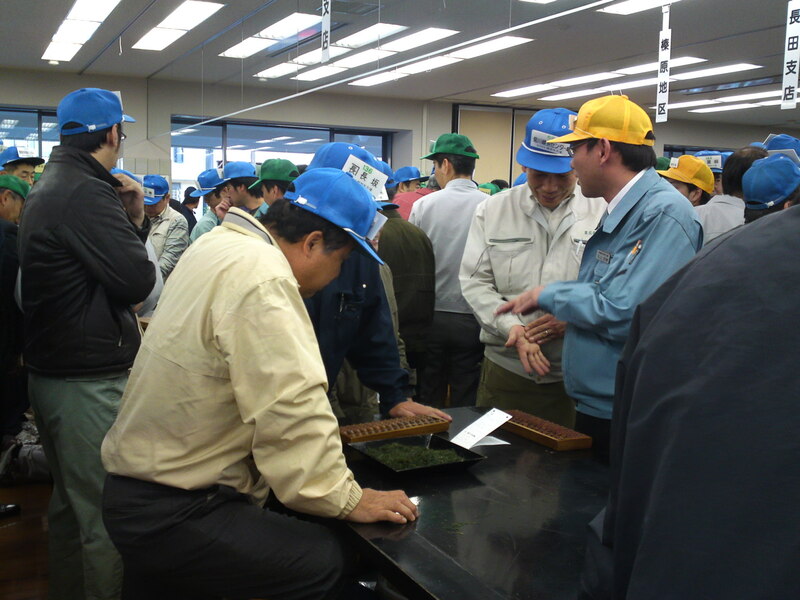 Japan, and especially Shizuoka prefecture, is renown for producing all kinds of succulent varieties of tomatoes. The Missus came back home with a batch of Ameera (meaning “sweet” in local dialect) tomatoes grown in the Western part of Shizuoka Prefecture. They are the size of large plum tomatoes and are very firm and sweet. You could actually eat them as fruit! 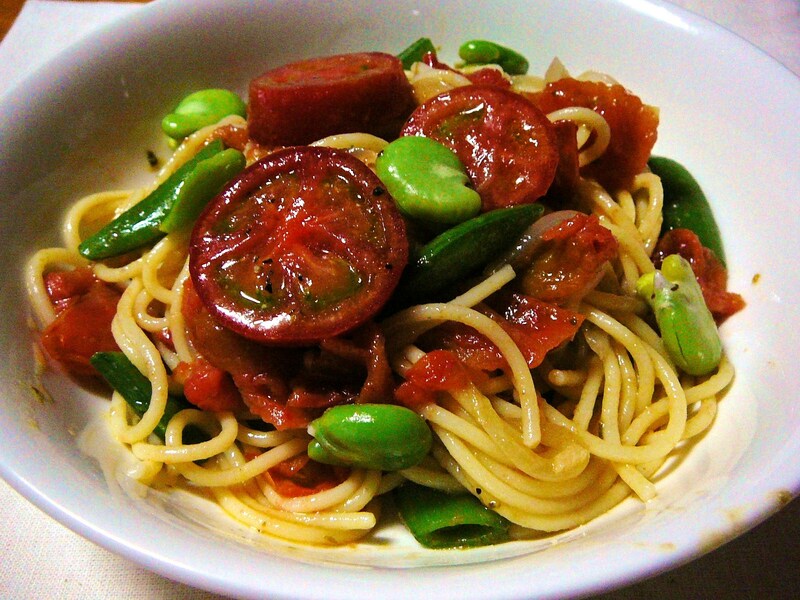 The weather having turned mild (it will soon be hot), cold pasta salad becomes a favorite! 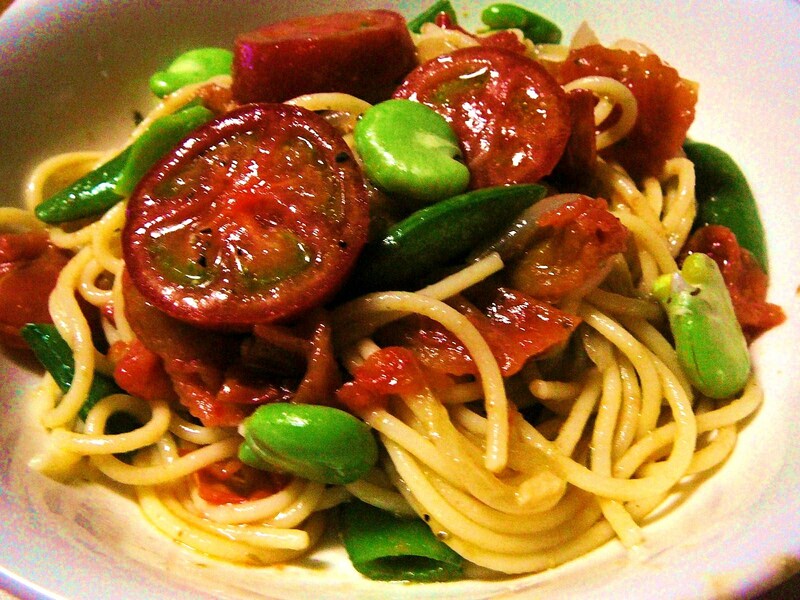 The Missus prepared some Spaghettini and let them cool down while she boiled some broad beans and peas in the pods. The latter once cooked (but still firm), she peeled the broad beans and cut the peas in the pod in halves at a slant. 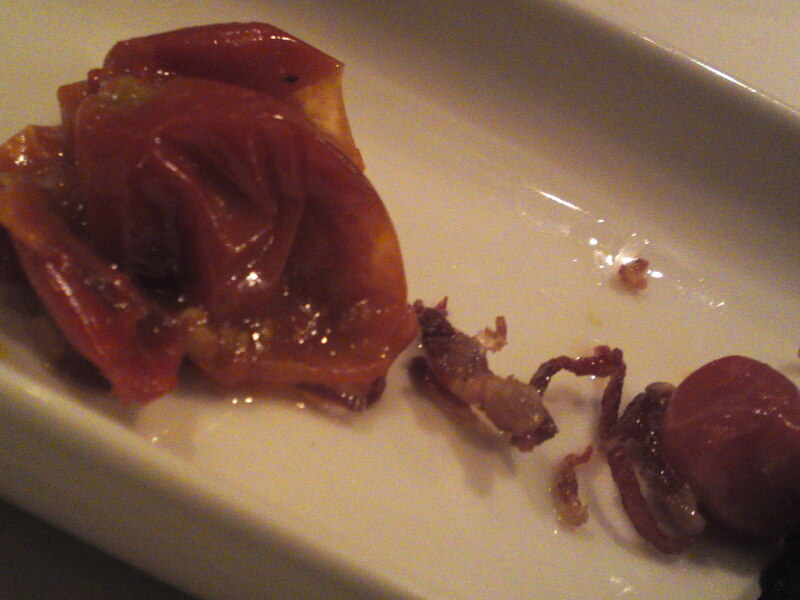 She sliced the tomatoes and fried them a little in olive oil. Once everyhing had cooled down to the same temperature, she tosssed the lot (including the tomato juices) with cold basil pesto based sauce and some pepper. Nothing else! 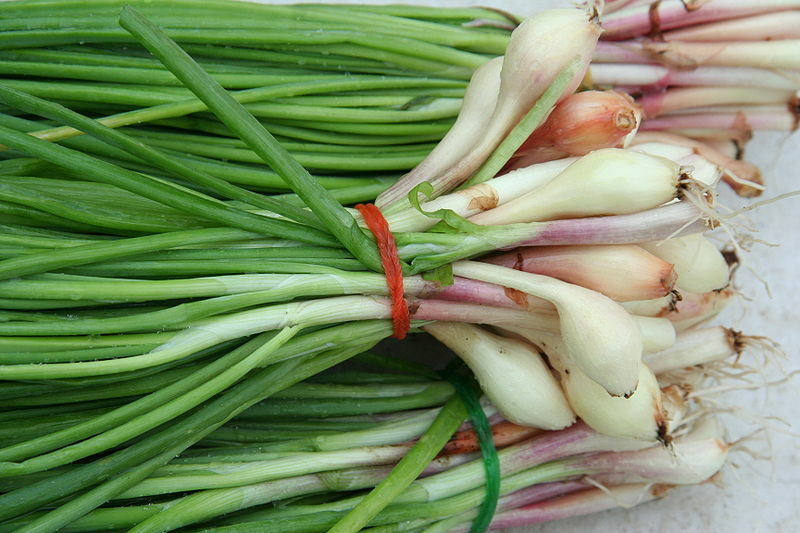 The fresh and natural combination of sweetness and light saltiness with basil was just perfect! Easy, yes. Great ingredients, yes! 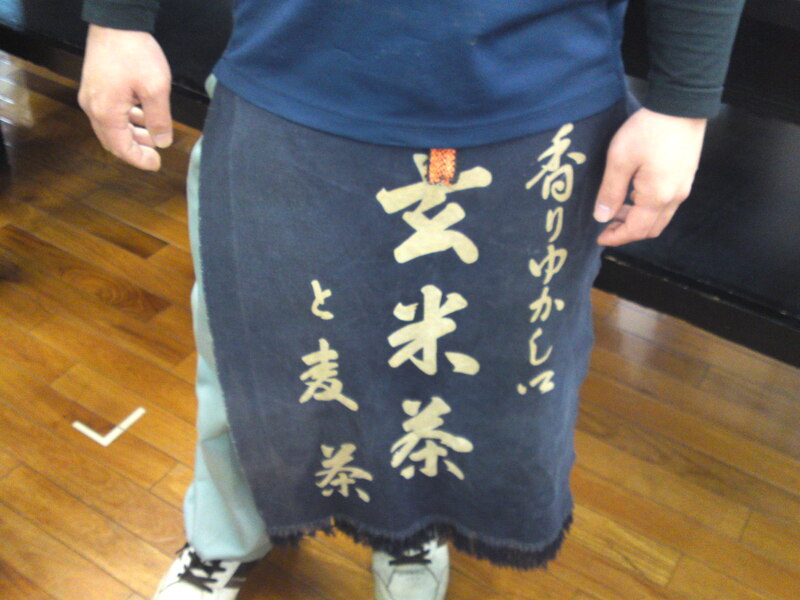 Mototsugu Kawabe/河辺基次, after graduating from the celebrated Kyoto University decided to go back to its roots and help with his parents’ soba shop in Fujieda City. But he did so with a remarkable difference! First of all, like many young people of his generation, he decided to go “local” as much as possible. 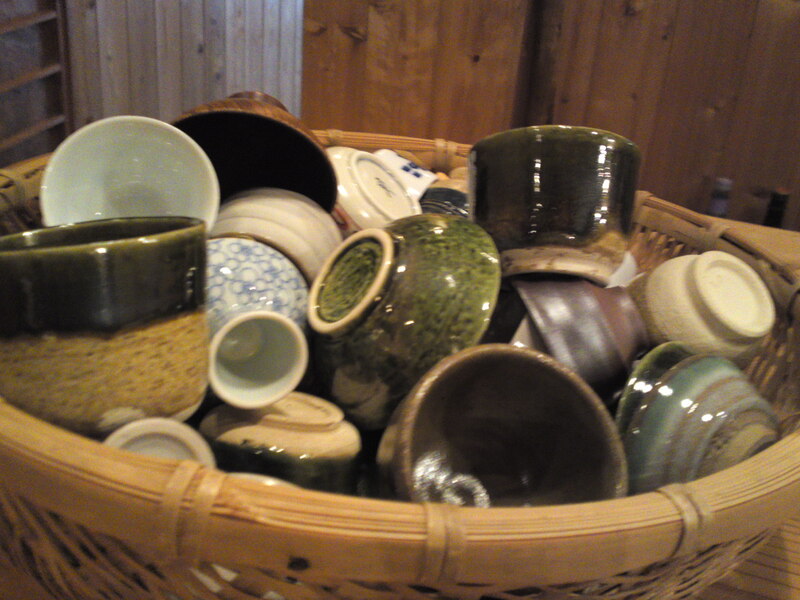 Choose you cup for your sake! But he went one and two steps ahead: The soba served at the their restaurant are all made with buckwheat he grows himself in Fujieda City! 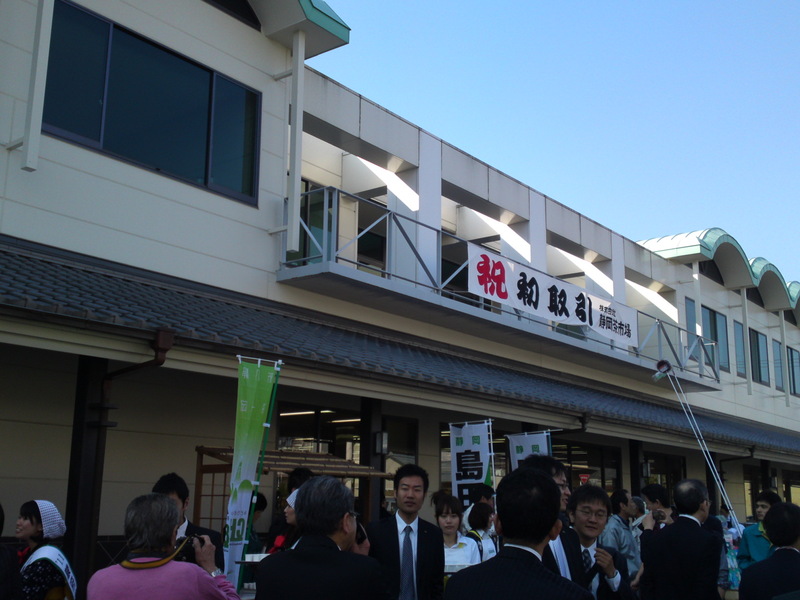 Yamahai Junmai by Sugii Brewery in Fujieda City! 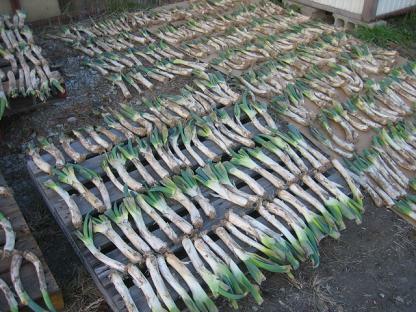 He also grows most of the vegetables used at their restaurant and all the chicken served there comes from an average of 240 Ikkoku Shamo Chickens, a very valauble species in the whole of Japan, as they also specialize in chicken served with their soba and also in yakitori. He must be a rarity not only in Shizuoka Prefecture but in the whole of Japan for taking the pains of using so many local ingredients! 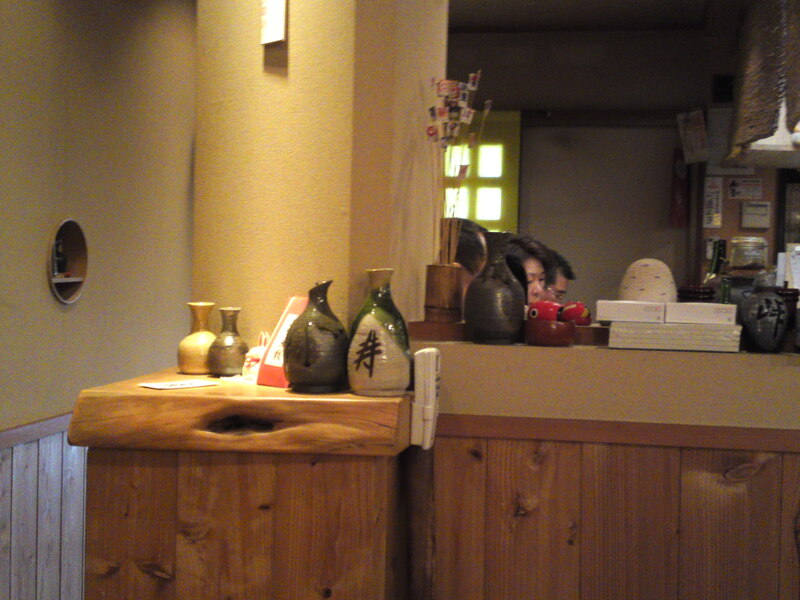 Japanese and expats alike will grow fond of the place for its traditional Japanese atmosphere! 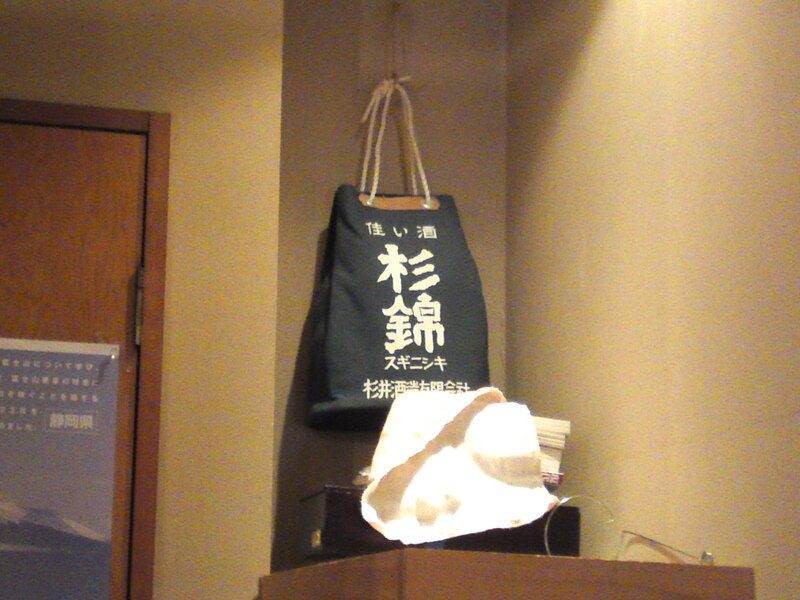 A bottle bag from Sugii Brewery, Fujieda City! Soba Sake Kawakatsu serves no les than 6 of their brews! I’m sure you will get tempted to take the bottle out and ask it to be filled! As it was my first (and certainly not the last!) 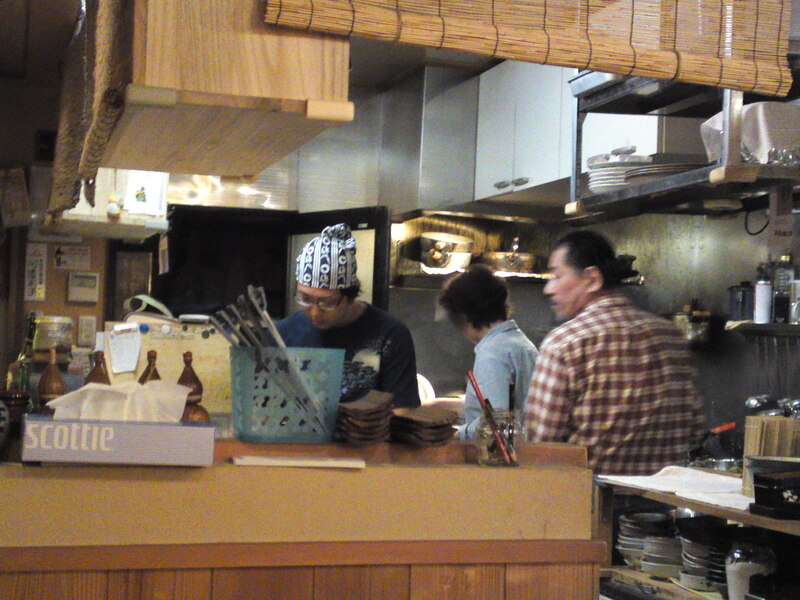 visit, I knew what to ask for: Ikkokoku Shamo (Chicken) eiro (chicken in stock with large leeks) Soba! 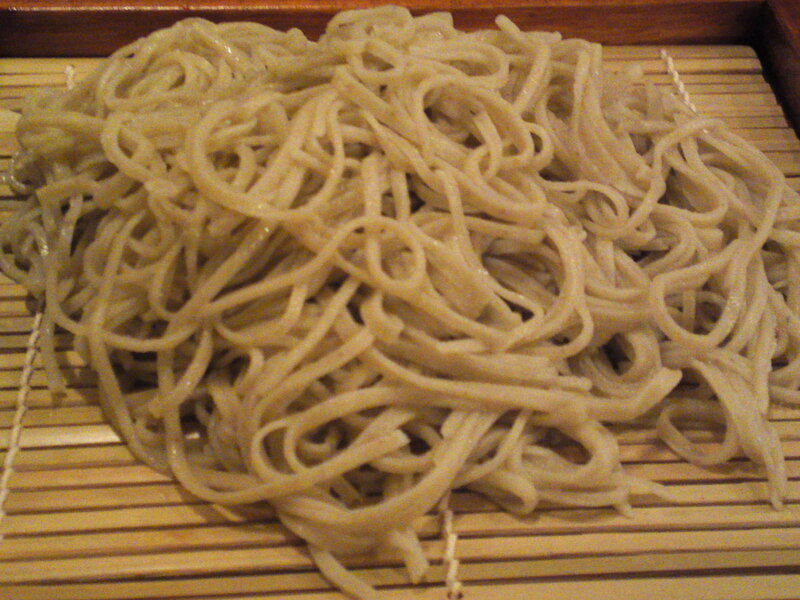 The soba are made with 100% own buckwheat! 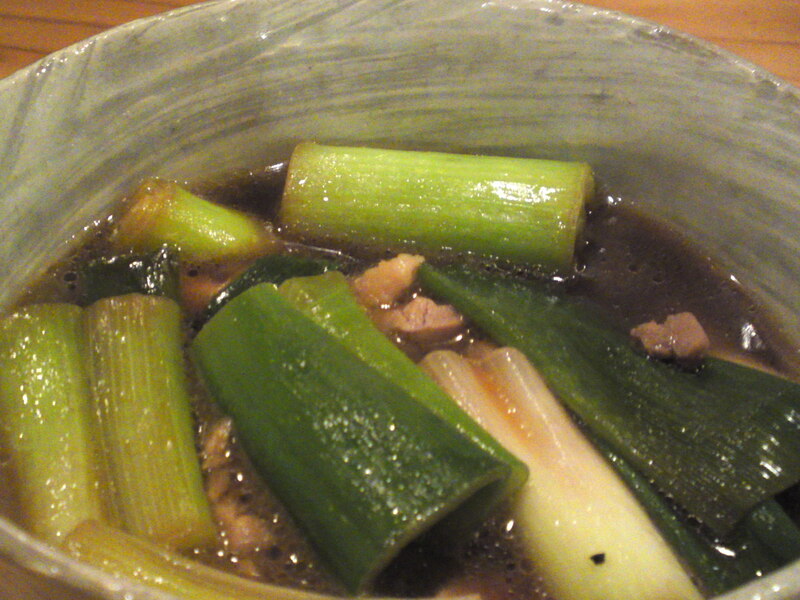 One dips his/her soba in the broth and eats the leeks and chicken in between! 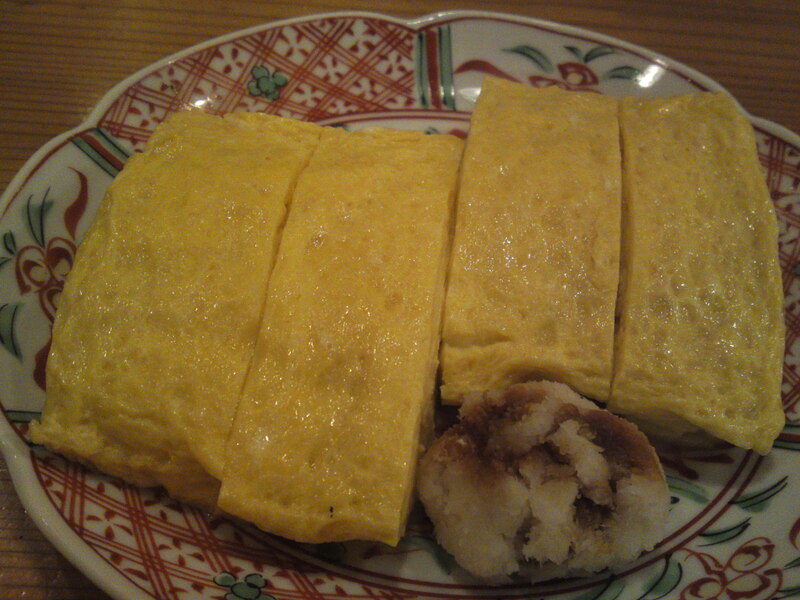 The dashi Tamago Yaki/出し卵焼き is made with the eggs of the same chickens! Beautiful both in looks and taste! I know quite a few expat friends who would travel all the way for it! The restaurant serves not only 6 different sake from Sugii Brewery in Fujieda but also 3 different shochu from the same brewery! 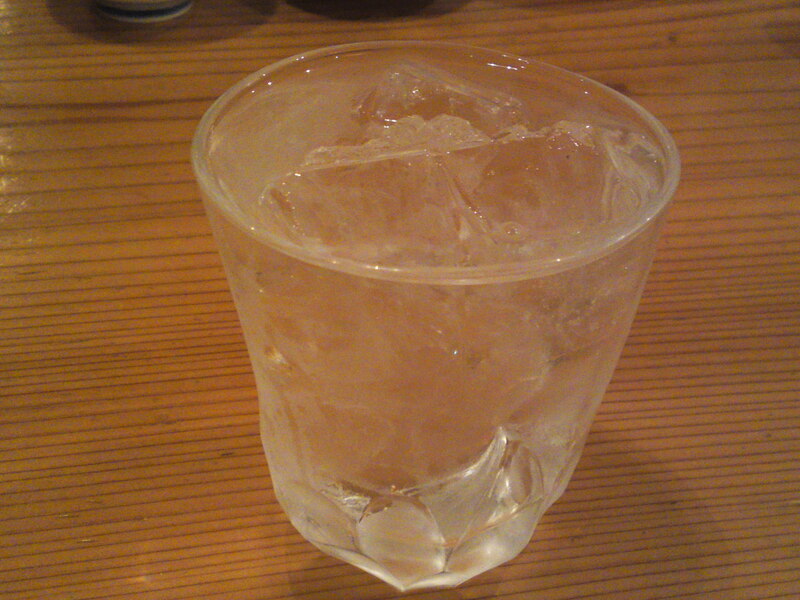 The above shochu was made with buckwheat grown by Mr. Kawabe! 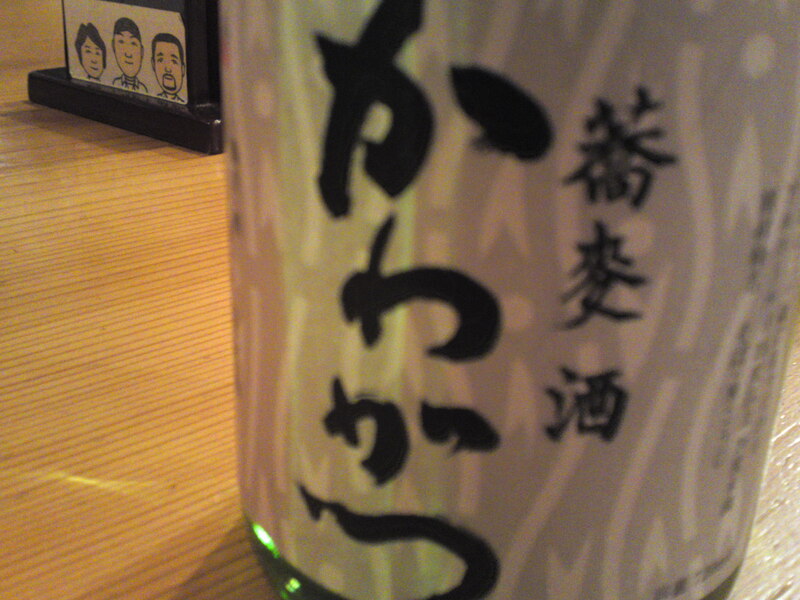 Kawakatsu Buckwheat shochu private label bottle! 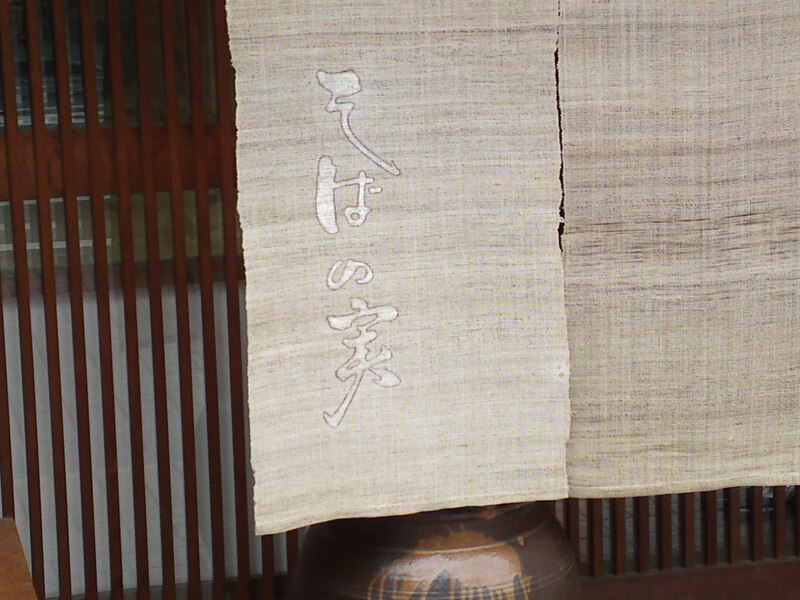 蕎麦酒　/sobashyu means buckwheat shochu! An to appreciate and finish my shochu. 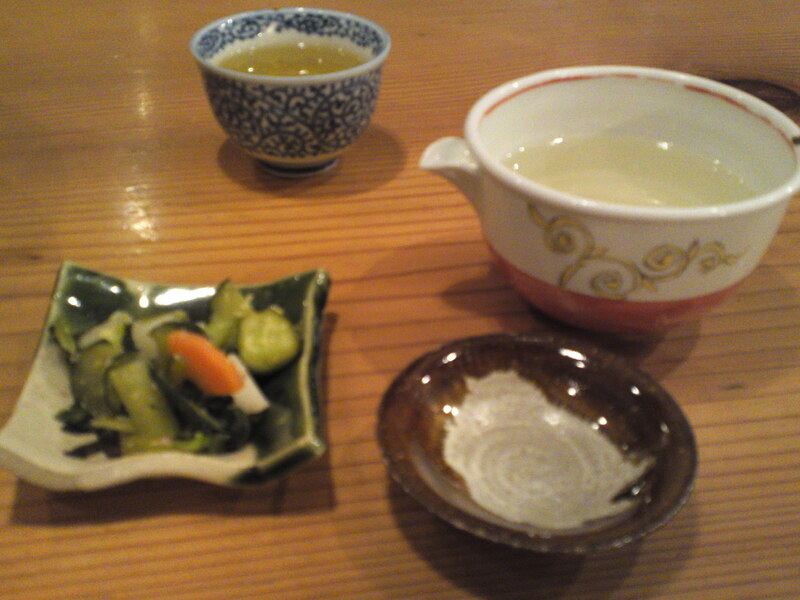 a beautiful plate of “okamisan no nuka zuke”/vegetables pickled in rice bran by his Mother! Next time, see you there for dinner! 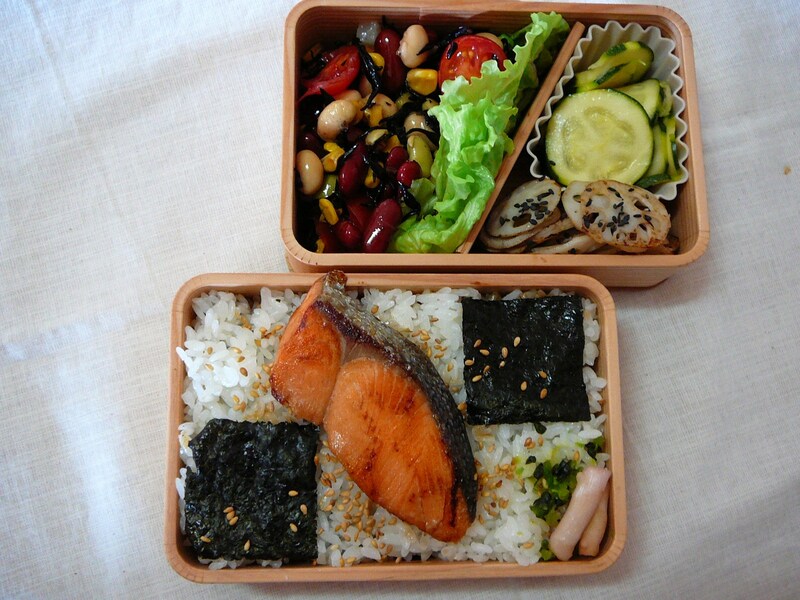 Today’s Lunch Box/Bento (’11/27): Salmon & Seaweed Bento! She filled the first box with two dinstinctive layers of rice. First she laid the first one and covered it with dry seaweed, a typically Japanese technique. 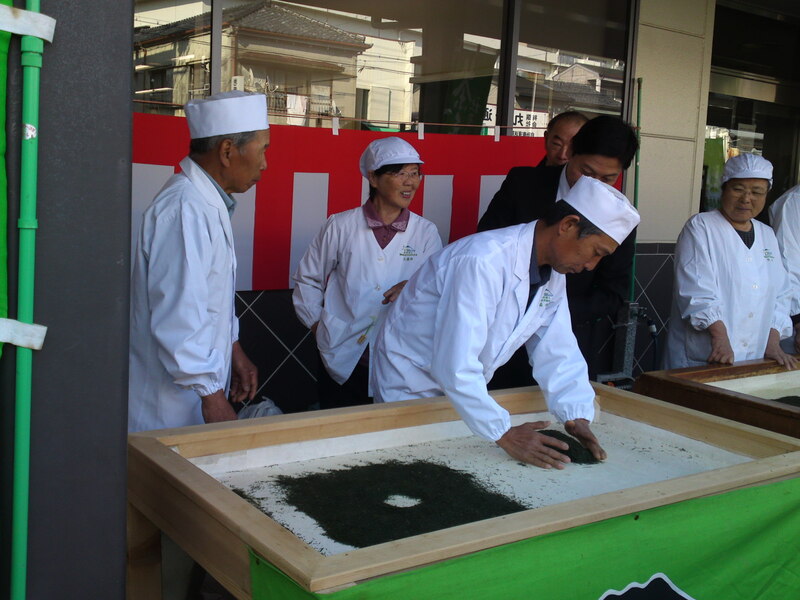 She then spread a second layer and placed two smalls quares of nori/dry seaweed fo pattern and sprinkled the lot with plenty of roasted sesame seeds. 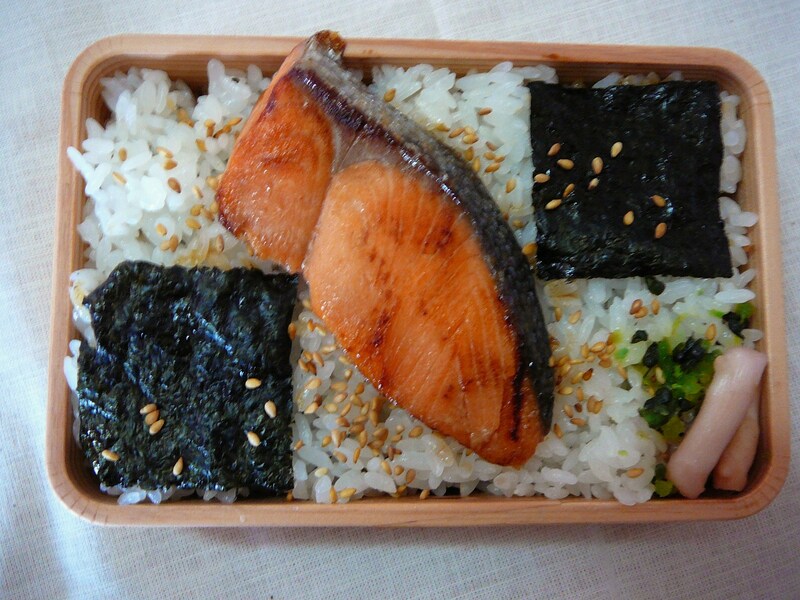 She finally placed on top a slice of salted salmon (fried in light teriyaku styke) she had been frying after the rice had been ready. Very tasty and soid in spite of her character! 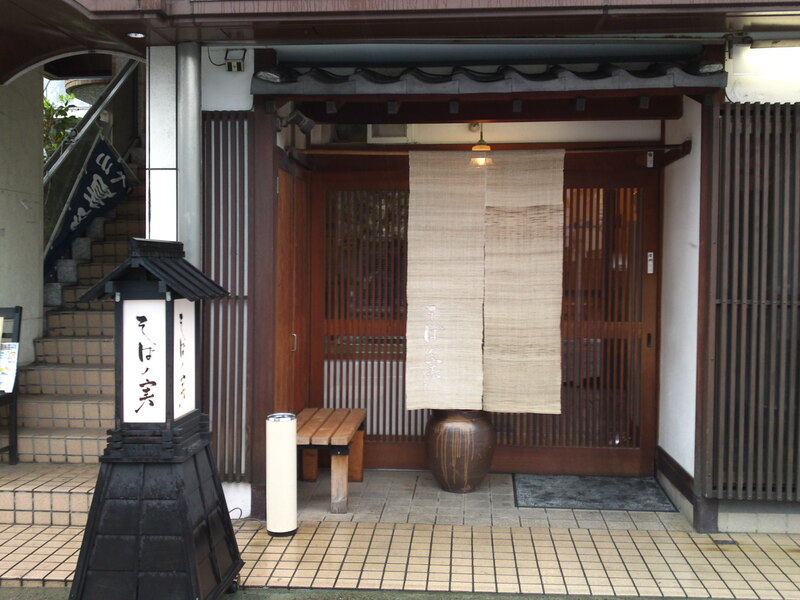 It’s been some time that a lot of friends have advised me to pay a visit to Soba No Mi, one of the most-established soba restaurants in Shizuoka City. I finally managed to find some time on this afternoon lunch to check on the establishment! It is a bit small in spite of the large entrance, but it certainly looks authentic! 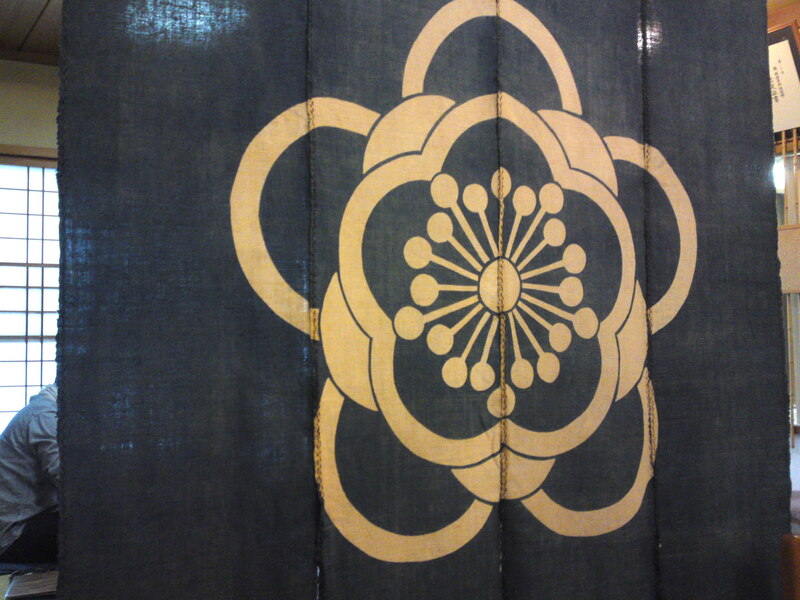 I love the sober-looking nore/entrance curtain! 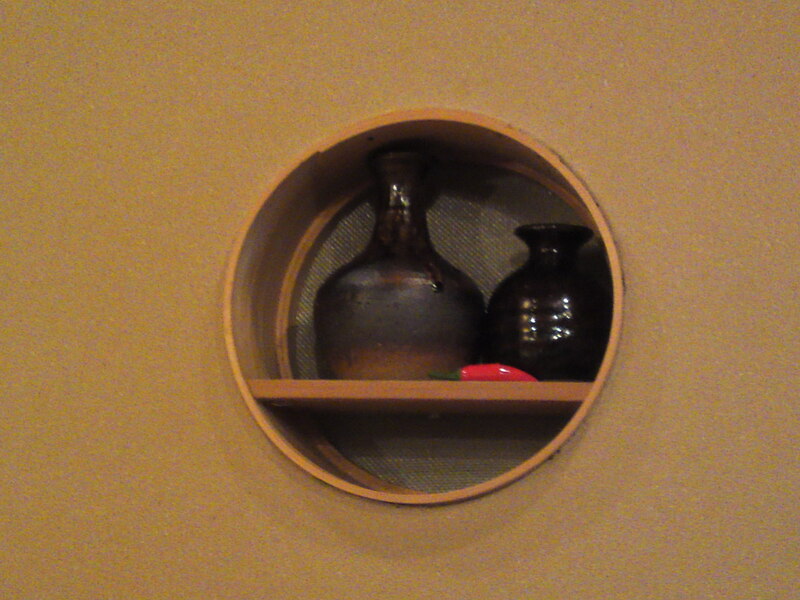 Another large noren inside makes for a clever partition between the guests sitting at tables (12) and those sitting on the tatami at the front of the establishment (~8). 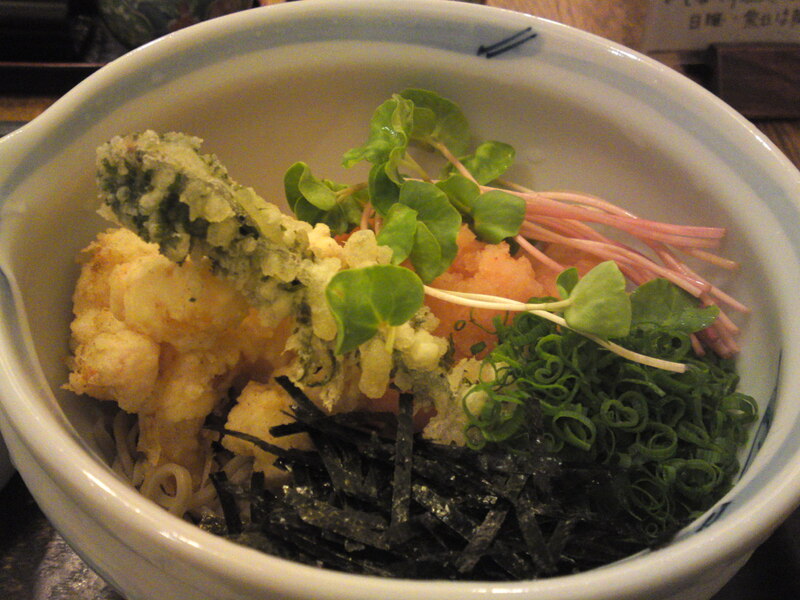 The menu was larger than expected, and I chose a favorite I can find in all soba restaurants worth their name: Momioroshi Soba and Tempura. 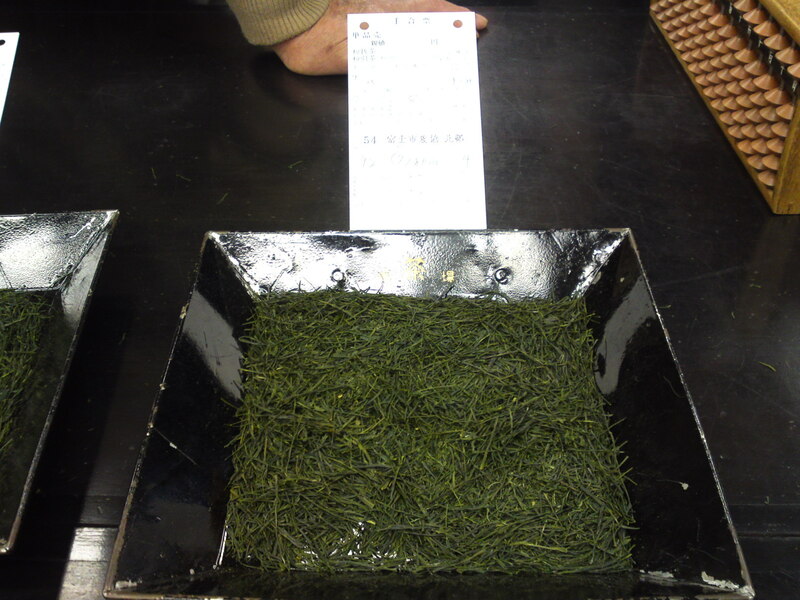 Notice that all soba are over 95% buckwheat, a pretty high level by any standards! 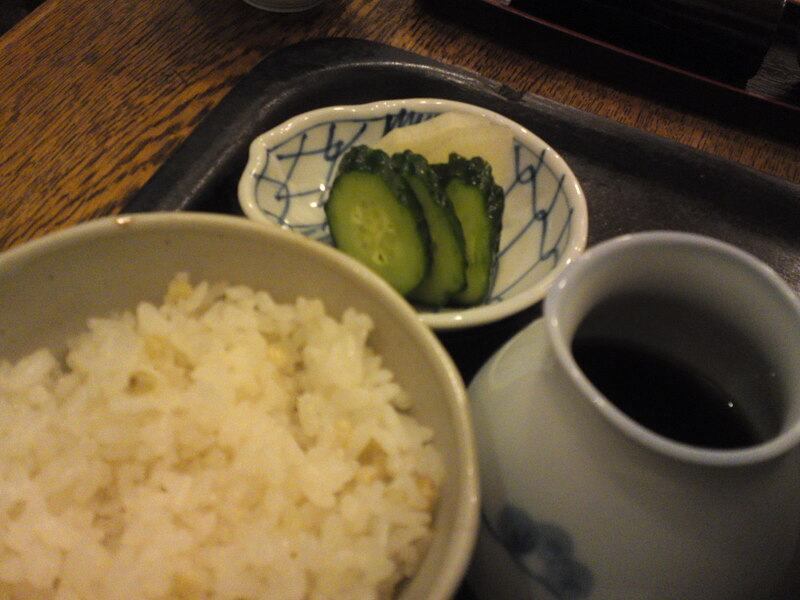 For lunch (except on Sundays) you will be offered an additional small bowl of rice mixed with buckwheat seeds. Tasty! 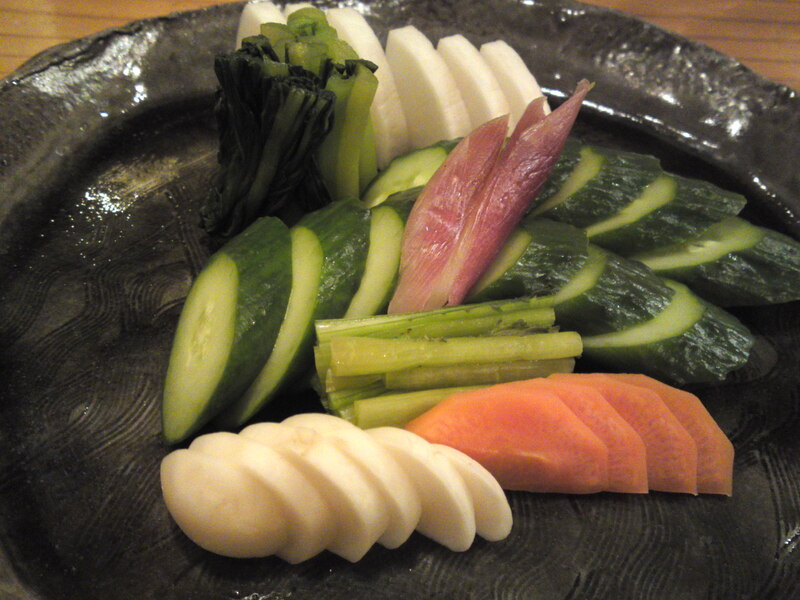 Of course you will also be served some o-shinko/Japanese pickles. 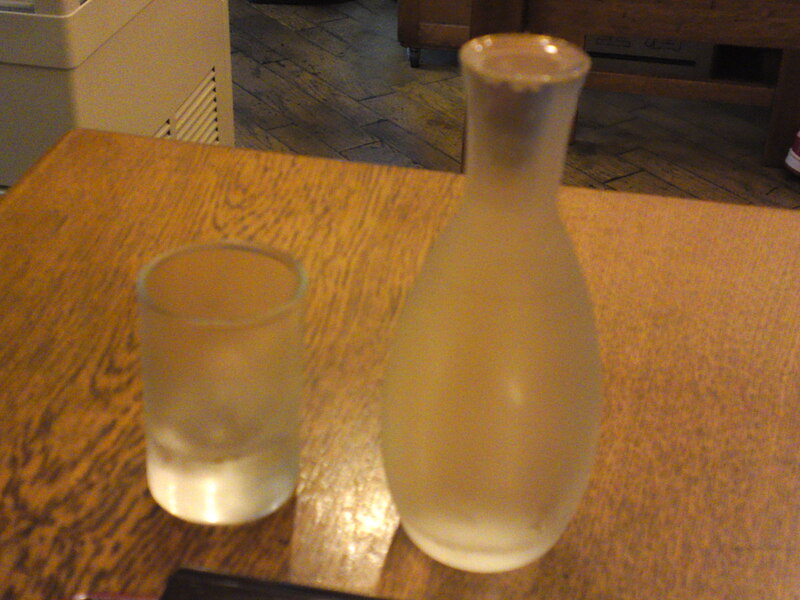 I do have a rule of the thumb for any soba restaurant worth reporting on: they must at least serve one local sake! 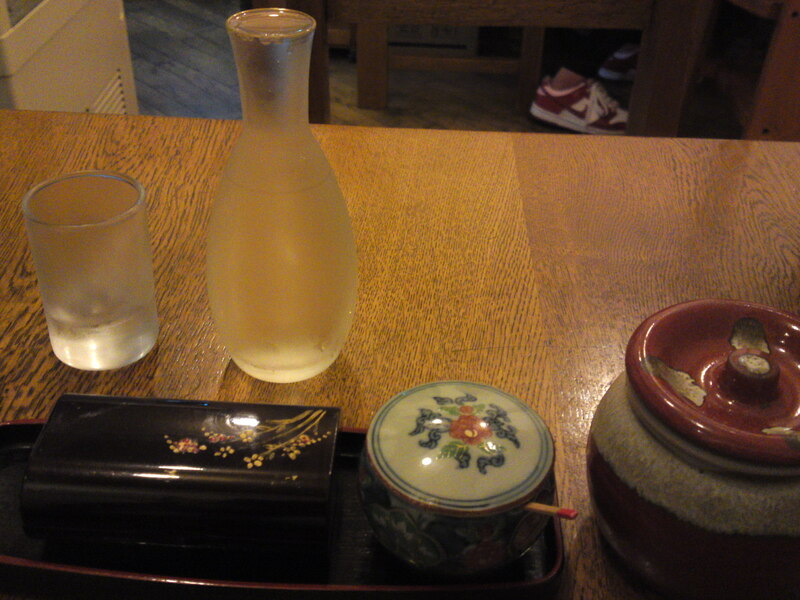 After all, in Edo times people drank sake at soba restaurants! Masu Ichi, Junmai Ginjyo by Masu Ichi Brewery in Shizuoka City! The buckwheat noodles were served with colorful buckwheat sprouts/hime soba, and dry seaweed, finely chopped thin leeks, and plenty of momijioroshi/grated daikon mixed with chili pepper. 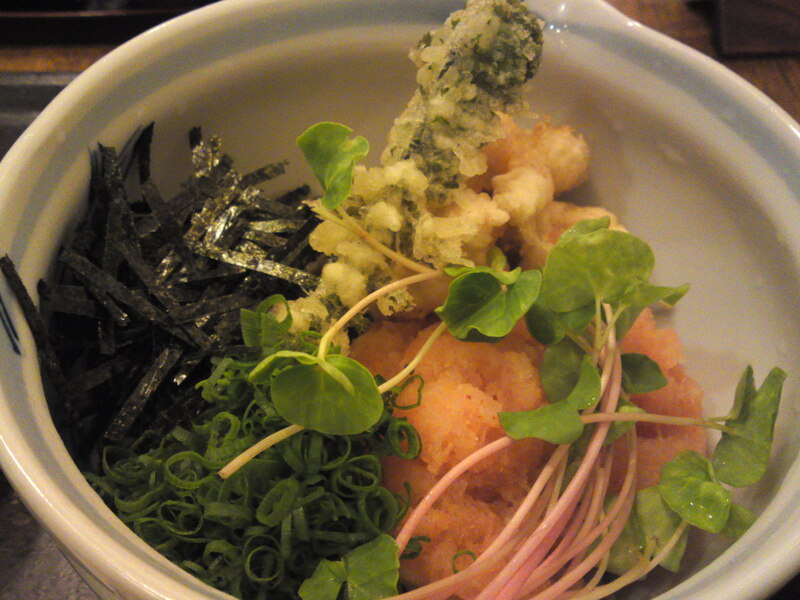 The tempura consisted of beautifully fresh kogomi/Ostrich fern (sansai/mountain vegetable) and succulent shrimps! 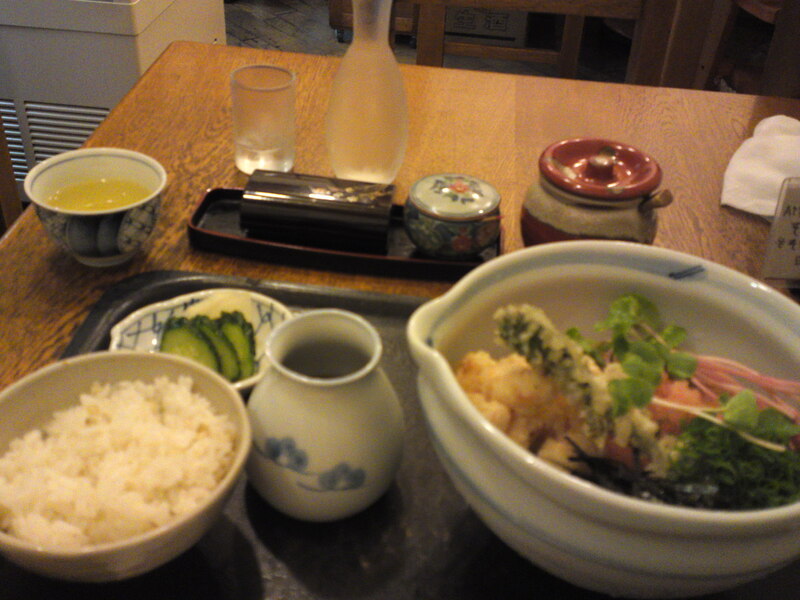 I ate the tempura as it is first (it doesn’t need any seasoning) with the rice. 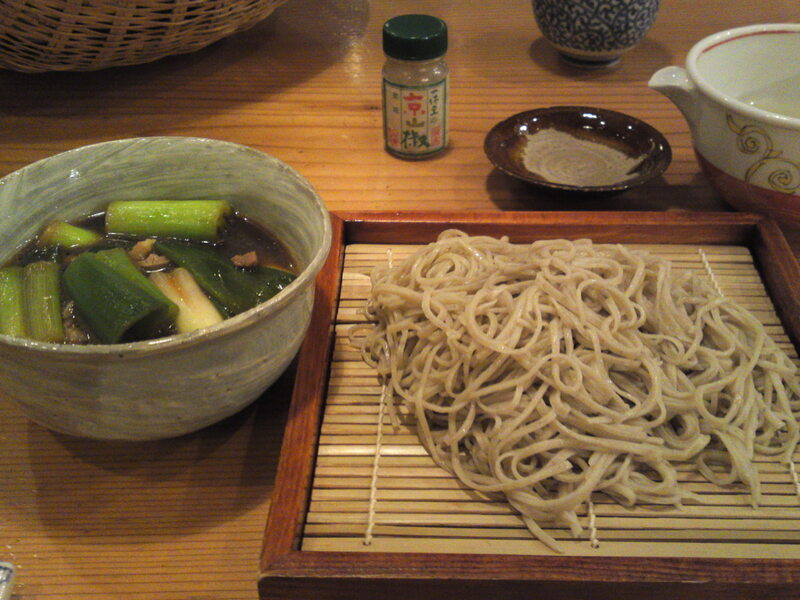 Later I poured the soba sauce into the soba and mixed it with the seaweed, chopped leeks and momijioroshi. I finished my meal by pouring some soba dashi (stock soup) into the leftover soup to drink the lot as a beautiful soup! Definitely worth a second trip!